the tallit katan, is worn in order to fulfill the mitzvah of tzitzit. Tallit katan with an Aleph-Beis train. Kosher tzitzit tied by hand by observant Jews. Size 3. Fits 2- and 3-year-olds.Measures 10" wide by 27.5" total height (front and back). For centuries, or perhaps even millenia, Jews who wanted to carry out the mitzvah of tzitzit all day wore an untailored tallit katan, which is essentially a rectangular piece of fabric with a hole in the middle for the head and a hole on each corner for the tzitzit strings. Made of either wool or cotton, a tallit katan (or “tallis koton”) is often referred to simply as "tzitzit," which can create a bit of confusion. According to the late Rabbi Aryeh Kaplan, in ancient times – as late as the classical Greek period – many garments were four-cornered. Rather than tailored, clothing generally consisted of a rectangle of cloth, straight from the loom and worn as a shawl, tunic, cape or toga. Similar garments were worn in Talmudic times. Since everyone wore four-cornered garments, they fulfilled the commandment merely by tying tzitzit onto their everyday garment. Because we no longer wear four-cornered garments, a special garment, the tallit katan, is now worn in order to fulfill this important mitzvah. Rabbi Yitzchak Abarbanel (Lisbon 1437-Venice 1508) noted that this is why the Torah instructs us to “make tzitzit… for all generations.” Though a time would come when four-cornered garments are no longer worn, we must continue to wear a special garment, i.e. 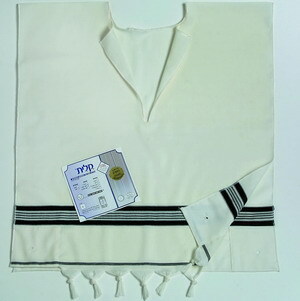 a tallit katan, in order to fulfill the commandment of tzitzit. On each of the four corners of the tallit katan is a hole through which the tzitzit strings are threaded and tied, according to various tying customs. Chassidic Jews have a custom of making two horizontally aligned holes in each corner, and according to Chabad, the holes are aligned diagonally. Whether you are buying tzitzit for the first time or the 50th time, there are a lot of details to be aware of, including sizing, fabric, style, tzitzit and tzitzit tying. When you set out to buy a tallit katan the first decision to make is the type of fabric you want to wear: wool, cotton or a cotton/synthetic blend. While the Shulchan Aruch says you should wear a wool tallit katan, because any other material is only required to have tzitzit according to Rabbinical law, Ashkenazim accepted the ruling of the Rema that cotton also requires tzitzit according to Torah law. Wearing a tallit katan is an honor and a privilege, but some Jews find it somewhat cumbersome to wear three layers – undershirt, tallit katan and shirt – every day, winter, spring, summer and fall. Then, about twenty years ago, the NeaTzit t-shirt tzitzit was invented. The NeaTzit was a cotton garment partially closed along the sides (if it is closed entirely there is no mitzvah to wear tzitzit on the garment), and designed to be worn in place of an undershirt. Sometimes called a t-shirt tzitzit or an undershirt tzitzit, the NeaTzit design caught on fast in Israel and around the world. Another advantage of the NeaTzit t-shirt tzitzit is that it tends to stay in place better than the age-old tallit katan design. This is a big advantage for athletes and for parents of little tykes who have slim chances of keeping three layers neatly tucked in all day. Sizing a tallit katan can be complicated. There is one sizing system for a wool tallit katan and another for cotton. Actually there are two for cotton, the traditional tallit katan and the t-shirt style (also known as “NeaTzit” or “TrimTzit”). And there is one tallit katan sizing system in Israel and another in the U.S. To reduce the confusion, we add separate sizing information on each product page. Since the tzitzit strings are the essence – the raison d’être – we provide a large range of options, both in terms of the tzitzit strings themselves, as well as tying options. The Torah tells us to make tzitzit for ourselves – v’asu lahem tzitzis (Bamidbar 15:38). Based on this verse, the Talmudic Sages and later the Shulchan Aruch ruled that tzitzit strings must be made with intent (“lishmah“), i.e. when producing the strings one must have intent from the outset that they eventually be used for the mitzvah of tzitzit. You cannot simply buy or make strings and then call them tzitzit. 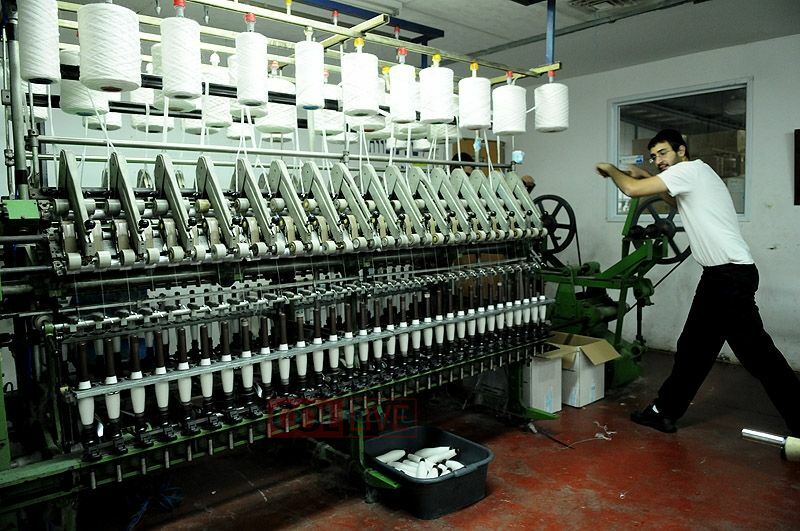 According to some opinions, if the person operating the production equipment has the intent to make tzitzit strings when he presses the button, the tzitzit produced can be used for the mitzvah. This is known as "machine-tzitzit." However, according to the stricter opinion, a real person must do the work for it to be considered lishmah. This is known as hand-spun tzitzit, or tzitzit avodat yad (or "avodas yad"). Some people are under the mistaken impression that “machine tzitzit” can be tied by machine. There is no such thing as a machine that ties tzitzit and there is no allowance in halacha to permit such a thing. Tzitzit are always hand-tied. Generally speaking, thin tzitzit are used on a tallit katan for aesthetic reasons, although some people may opt for thick, which are less likely to break. If you are tying tzitzit yourself, thick may be a bit easier on your fingers. Today, while most people prefer to buy a tallit with the tzitzit already tied, some people opt to tie the tzitzit themselves. According to halacha, fulfilling a mitzvah yourself is always considered preferable over having someone do it for you. 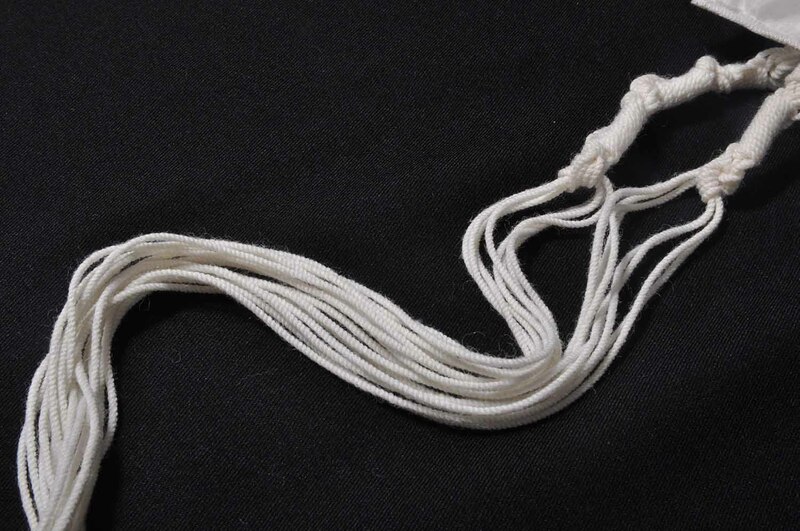 Although in some cases – shechita, bris mila, writing a mezuza scroll or making tefillin, to name a few – you should probably leave it to a professional, tying tzitzit does not take long to learn. Tying tzitzit is an important skill to learn, not only because you will become "tied" to the mitzvah and closely familiar with the mechanics of it, but also because you will be able to retie tzitzit strings should they unravel or break. Whether you plan to tie the tzitzit yourself or buy a tallit with pre-tied tzitzit, you’ll want to know the basics beforehand. Ashkenazi tzitzit - The most prevalent tzitzit tying custom, by far, is the Ashkenazi custom of five double knots with coils in between (7, 8, 11 and 13 coils respectively). Sephardic tzitzit - Sephardic Jews add a special loop around each coil, known as a chulya. Once you learn how to do the loops, this method of tying is not hard at all. They generally make 10, 5, 6 and 5 coils respectively, hinting at the Tetragrammaton, whose letters in Gematria are 10, 5, 6 and 5. Some Sephardim follow the 7-8-11-13 pattern for their tallit katan. Yemenite tzitzit - A significant portion of Yemenite Jews follow the halachic rulings of the Rambam (Maimonides), who prescribed a unique method of tying tzitzit (shown at right). To be honest, I had watch two videos and consult with three different “tutors” before I was able to do the special knot, which is quite counterintuitive. Chabad tzitzit - Finally is the Chabad tzitzit tying custom. It starts with a very innovative technique of looping the shamash through an extra hole in the tallit to keep the tzitzit from working their way around to the wrong side of the tallit. Then chulyos are made, with varying numbers of coils in each chulya. The mitzvah of tzitzit is considered equivalent to all of the other commandments. Because we are unable to fulfill all of the 613 mitzvahs, when we wear tzitzit, which are meant to remind us of the obligation to keep all of the commandments, it is considered as if we did in fact observe them. However, we must bear this intention specifically in mind, writes the Pele Yoetz (Rabbi Eliezer Papo, 1785-1826). Is it mandatory to wear tzitzit? In a famous responsum Rabbi Moshe Feinstein wrote to his son Rabbi David Feinstein, shlita, the elder Rabbi Feinstein agrees with his son’s analysis that although there is no absolute halachic requirement to wear a tallit katan, there is a binding custom to do so. The following are a number of Midrashic and Talmudic sayings in praise of wearing tzitzits. “This is my G‑d and I will beautify Him” (Exodus 15:2). Be beautiful before Him with mitzvot … a beautiful tallit. One who meticulously observes the mitzvah of tzitzit is rewarded with [the resources to afford] a nice wardrobe. “The L-rd desires for the sake of Israel’s righteousness to make the Torah great and glorious” (Yeshayahu 42:21). G‑d did not leave anything in His world which does not involve a mitzvah for Israel. Humans wear clothing, so G‑d commanded to attach tzitzit to their garments. A Torah scholar must be proficient in the laws of tzitzit. When one observes the mitzvah of tzitzit, it is considered as if he has observed the entire Torah. This mitzvah of tzitzit is the equivalent of all the mitzvot combined. Whoever observes the mitzvah of tzitzit meticulously will be found worthy of beholding the Divine Presence.